Today is April 9th and this means that Grand Duke Jean and the late Grand Duchess Joséphine-Charlotte would have celebrated their diamond wedding jubilee today. Some time in November 1953, a 26-year-old Princess Joséphine-Charlotte sat down on her father's lap to tell him that she had gotten engagement. "To whom? ", asked the surprised King Leopold III of Belgium and his daughter smilingly answered "To Jean of Luxembourg." Much has been made of the engagement of then Hereditary Grand Duke Jean and Princess Joséphine-Charlotte. It is usually said that their union was an arranged one; or at least heavily suggested by the fiancée's grandmother Queen Elisabeth of Belgium and the fiancé's mother Grand Duchess Charlotte, who coincidentally was also Joséphine-Charlotte's godmother. News reports at the time speculated that one or both of them were in love with commoners who were considered unsuitable marriage choices. Wherever the truth lies, Jean and Joséphine-Charlotte had known each other for most of their lives and had struck up a friendship. Even though the press and society in general is usually quick to conclude that an arranged marriage can only be loveless and miserable, their marriage was by all accounts a happy one and many sources claim that they did eventually fall in love with each other. No one will probably ever forget the grief-stricken tears of Grand Duke Jean at his wives funeral many years later. Soon after the engagement was made public, the royal courts announced that the wedding would take place on April 9th at the Cathédrale Notre Dame in Luxembourg City. Two days before on April 7th, tens of thousands of Belgians turned up at the royal palace in Brussels to wish their princess all the best. She appeared on the balcony to greet the cheering masses. Together with her family she then travelled by train from Belgium to Luxembourg on April 8th. Hereditary Grand Duke Jean met the special royal train at the border and greeted his soon to be wife with a kiss before the train rode on into the city of Luxembourg. Once again, thousands of well-wishers welcomed the Belgian princess in her new country. In the evening hours, a ball was held at the palais grand-ducal. On April 9th, Hereditary Grand Duke Jean and Princess Joséphine-Charlotte were firstly married in a civil ceremony at the palais by mayor Emile Hamilius, before making their way to the cathedral for the religious wedding. Despite light rain, Jean and Joséphine-Charlotte travelled in an open carriage. About 100.000 to 140.000 well-wishers lined the streets, a number twice as high as had been expected. Many of them had made the (rather short) way from Belgium. In fact so many Belgians visited the Grand Duchy for the weekend that the Luxembourgish government asked the citizens to open their own homes to the guests as all hotels were booked months in advance. The streets were decorated with flowers and flags of both Belgium and Luxembourg. 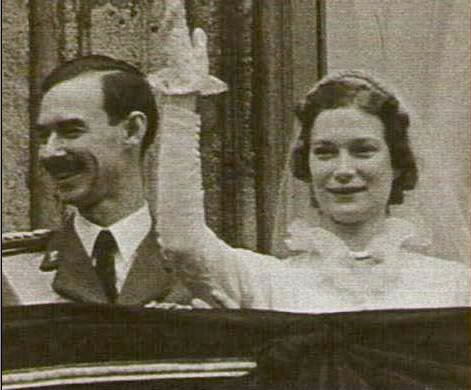 While Joséphine-Charlotte was let to the alter on the arm of her father, the former King Leopold III of Belgium, Jean was accompanied by his mother, Grand Duchess Joséphine-Charlotte. Prince Alexandre of Belgium, Joséphine-Charlotte’s younger half-brother and godson, carried the train of her white organza dress. The high collared and ruffled dress was made of two layers seperated by white tulle. The train was about four meters long and made of handmade needlepoint and pillow Brussels lace. Her veil was also made of Belgian lace. 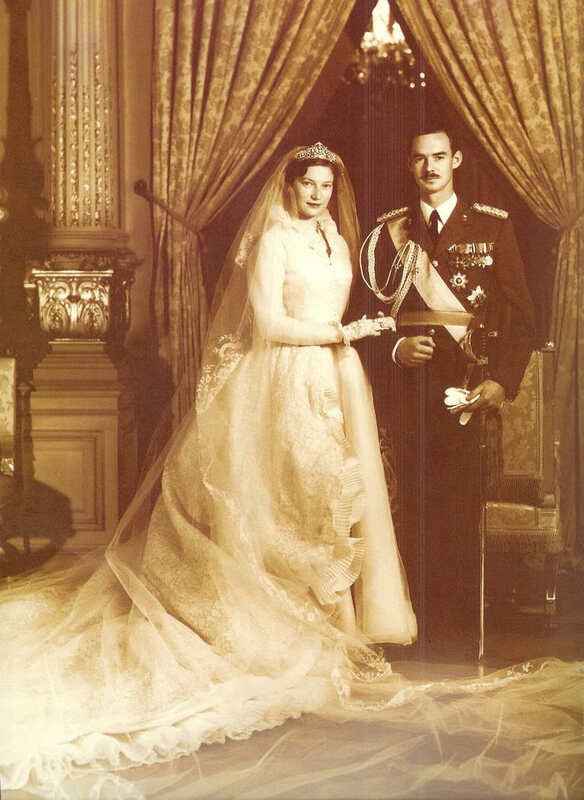 During the actual wedding ceremony Joséphine-Charlotte wore the Congo Diamond Necklace Tiara, later she opted to change into the Belgian Scroll Tiara for the official wedding pictures. Jean wore the olive green uniform of the Luxembourgish army as well as the Luxembourgish Order of the Gold Lion of House of Nassau and the Belgian Order of Leopold. Not only the Luxembourgish sky was clouded on the wedding day. Joséphine-Charlotte's teary mood and (almost) fainting is often attributed to the (apparent) fact that the wedding wasn't a love match. It later surfaced that other problems had been lingering over the occassion. As you may know, Princess Joséphine-Charlotte had lost her mother, the beloved Queen Astrid, at a very young age when she tragically died in a car accident. 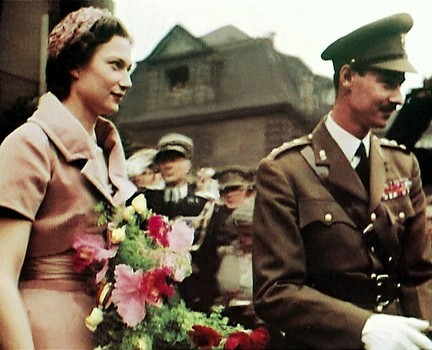 The widowed King Leopold III married the Belgian commoner Mary Lilian Baels during the Second World War. The wedding wasn't too well received by the Belgian public. Through her marriage she automatically had become a Princess of Belgium but the question of her right of precedence remained. Princess Lilian had apparently insisted of taking the place of the bride's mother but was disputed by Queen Elisabeth, the mother of King Leopold III. In the end, Queen Elisabeth entered the church on the arm of Prince Felix, husband of Grand Duchess Charlotte, and Princess Lilian was placed eight. Appearing shaky, pale and nervous during the religious ceremony, the long fighting - which had resulted in Queen Elisabeth travelling to Luxembourg seperately - is said to have been despairing the bride, who confused the order of responses to her vows, began crying and almost fainted during the service. During the whole service, Jean tried to console his bride and repeatedly asked if everything was alright. After the service was over, the newly wed couple made their way back to the palais in an open carriage even though in now rained quite heavily. Joséphine-Charlotte seemed revived and smiled happily but reportedly fainted some time later on. The couple appeared on the balcony at the palais, where a reception for more than 700 guests took place, a few times. Due to the bride's indisposition their honeymoon to the Mediterranean was cancelled and Jean and Joséphine-Charlotte spent their time in the lovely Grand Duchy instead.